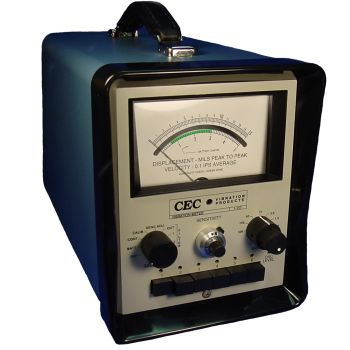 CEC’s 1-157 Vibration Meter is a portable unit which indicates peak-to-peak displacement and average velocity. CEC’s 1-157 Vibration Meter is a portable unit which indicates peak-to-peak displacement and average velocity. Designed for use with self-generating type velocity sensor, the input signal is averaged and displayed on a meter in peak-to-peak or average values based upon equivalent sinusoidal input. The 1-157 can operate from either AC or battery power by switching a power pack module located in the rear of the unit. Internal test circuits provide means of calibrating the instrument for the particular vibration transducer being used. Another test circuit is provided for testing the batteries with the battery power supply. An additional circuit acts as an ohmmeter to check continuity of the vibration transducers being used. Each of the six channels of the 1-157 contains its own sensitivity adjustment.